I am not saying that these things are not wonderful and I more than many passionately believe in the positive power of the birth environment. I also think most people want a intervention free, natural and drug free water birth around our ‘due date’. Whilst there are a number of things we can do antenatally to increase our chance of a natural birth, not everything goes to plan in life, and sometimes the unexpected happens. I tend to find birth stories come in extremes, either horrifically terrifying life and death tales or life-changing blissful home births. But what about if neither of them materialise, what if the unexpected happens, what if your birth plan miraculously doesn’t guarantee that your birth goes to plan? Does that mean your labour and birth has to become the horrifically terrifying life and death tales? I say no, not with the right frame of mind and preparation! It seems even giving birth to a baby prematurely at 27 weeks in a labour ward abroad were you dont speak the language can be positive! 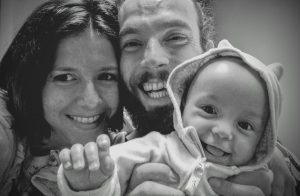 It was my absolute pleasure to have Marcela and Dimitris attend my Hypnobirthing workshop in Edinburgh a few weeks before Marcela prematurely gave birth whilst on holiday in Germany. We have a lot to learn from their story! As a midwife I often find that advice and beliefs around birth can come in extremes but with the right preparation you can have a positive birth regardless of how or where you give birth; even when things don’t go to plan. What I love about Hypnobirthing is that the benefits are more far reaching than just increasing your chance of a natural birth; I truly believe that baby’s born to mums that can stay calm and peaceful during labour and birth have the best start in life. This story is testament to that. Marcela and Dimitris showed their strength and wonderful outlook during a time that could have been traumatic and stressful. Beautiful baby Leo was born at 27 weeks, his labour was peaceful and his parents remained calm and accepting at all times. Marcela is passionate about sharing her story, especially to help others who may have a baby born prematurely. So please do share this inspiring story and know that a positive birth can come in many forms. ‘ Oh you must have been so stress!! !’ is the first thing we often hear (accompanied by a look of anguish and almost horror in their eyes) when we tell people our son was was born unexpectedly, at 27 weeks of pregnancy, while we were visiting family in Germany. I usually just politely reply that we were fine and that it wasn’t that bad, because I don’t want to sound like a snob or arrogant by saying “actually we weren’t stressed at all and we were thrilled to meet our baby!”. As any new mum, I had my questions and doubts during pregnancy, is it going to hurt me? how much? will I be able to cope? and so on. I was actually blessed with a wonderful and easy pregnancy, I kept fit and healthy doing yoga almost daily, pilates and swimming once or twice a week. 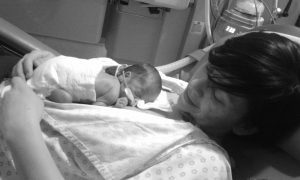 I felt physically strong and ready to be able to give birth, but I felt that something mentally was missing. A few friends mentioned Natal Hypnotherapy and I thought I should give it a try so I started listening to the CDs since the early weeks of my pregnancy. I wanted to continue preparing and practising and that is how I found out about Gemma’s workshops in Edinburgh. My husband and I were certain that we’d rather spend our money on courses that would help us prepare, rather than in expensive nursery and clothes nonsense. We had initially booked to attend one in March, as our baby was due in late April-early May. However, since I had a few doubts and after speaking to Gemma on the phone she suggested that we could attend the mid-January course instead so we could have more time to reflect and prepare for our baby’s birth. Little did we know that our baby would be born only two weeks after that course; all things happen for a reason! The workshop was unbelievably helpful and inspiring, and Gemma was really good at helping us face any doubts we had and making a ‘mind-map’ with the birth stages which we found very useful and had on our wall. That and writing my birth affirmations was very helpful. as it reminded me everyday of how capable I was going to be to birth my baby. We also met three other like-minded couples, who have become friends and it has been wonderful to share our birth stories between us and to meet again to see our babies grow up! In late January, we travelled to Germany to visit our family, as we do every year. At only 27 weeks of pregnancy after checking with my midwife, she was happy for me to fly, my pregnancy was a low risk so there was no reason why I couldn’t. After all, we were only going for a long weekend, or so we thought! We arrived on a Thursday evening and on Friday I was uncomfortable all day, chilling out at my cousin’s house and not even imagining that I was already in the early onset of labour. I was happily listening to my Natal Hypnotherapy tracks all day as these kept me relaxed, but also watching films, playing with my niece and having long baths in their beautiful big bath tub (which now that I think about it really looks like the hospitals birth pools!). I was experiencing some pain, but I thought it was the normal aches and pains of pregnancy, maybe just muscular. So in the evening when I was about to go to bed, I went to the toilet and noticed a bit of bleeding, but again I never panicked, just thought it may be wise to go to the hospital and get it checked. My cousin’s wife Sabine is German so we thought it would be best that she came with us and help us to translate, as Dimitris and I speak no German at all (at least we didn’t then!). We arrived to a gynaecology clinic and by this point I was having to walk a bit slower than usual but again just thought it was something to be checked and that was all. There was an experienced midwife on shift and as soon as she saw me walk in she said “you’re in labour” and she was right, I was already 3cm dilated without even imagining it! Then a team of doctors came and started having long discussions in German, and Sabine translated to us that “this was serious” and that “the baby was coming now”, to which my only response was “oh my God”. Not because I was scared, but because I couldn’t believe I was going to meet my baby 3 months before I expected to! We were transferred to another hospital where they have a neonatal care unit, and the doctors explained to us that they would do their best to stop my contractions for 48 hours so that they could use cortisone to help our baby to develop his lungs so that he wouldn’t need to be on a ventilator for oxygen supply after being born. And so it began, the longest and only stay that I have had in hospital so far. Dimitris stayed with me in the room all the time and the hospital staff were fantastic, they arranged a bed for him so that he could sleep in the room with me and even gave him vouchers for the canteen so that he could also eat when he needed to. Maria, the gynaecologist who checked me turned out to be Greek-Cypriot, so Dimitris could communicate with her no problem. She finished her shift on Saturday morning and asked our baby to wait and not to be born before she was back on Monday morning as she wanted to be the one to deliver him. I’m not going to lie, the 3 days that I stayed in hospital were long, but I never felt scared, anxious or nervous. I was just living the moment, knowing that my baby was fine and that I was fine. Or as that lovely nurse told us one time that she checked on us “Baby ist gut. Mama ist gut, alles ist gut!”. I couldn’t believe how calm I was, how calm my husband was (although he usually is a very calm man!) and how happy and calm our baby was inside me. I was surprised at how I was handling the whole situation. We had wonderful doctors and nurses looking after us and I will all my life thank them for their service and what they did for our family. They helped to keep me calm, but I am a hundred per cent convinced that having practised natal hypnotherapy almost daily was key to us having such a beautiful and calm experience during what could have been potentially a very scary scenario. During that weekend, I kept on relaxing and listening to my natal hypnotherapy tracks over and over until I fell asleep and then again when I woke up, it just helped me keep centred. On the Monday morning, the wonderful gynaecologist who had seen me on Friday morning came back and I got checked, by this time I was already 5cm dilated so even with them trying to stop my contractions, our baby was eager to come out and see this world! By this time I was pretty tired and a bit bored of lying on a bed all weekend. I had a moment of self doubt in which I told the doctors that I wasn’t sure I was going to be able to give birth naturally as I was already very tired. My whole body was in ache, not from the contractions but just from being in bed without standing for so long. The doctors were wonderful and they advised that our baby was in a good position to be born naturally and that since he was small, the labour wouldn’t take long. So I decided to have a natural birth since that is what I was hoping for from the start. I got transferred to a beautiful big room which looked pretty much like the ones in the brith centre at the Royal Infirmary in Edinburgh. It had a birth pool in it but I didn’t feel like using it, and I probably couldn’t have anyway because our baby was going to be so premature. After discussing it with Dimitris, I decided to ask for an epidural, which I got on a low dose as I could still be mobile, move around and walk. Throughout my whole stay in hospital, the doctors and nurses discussed everything with us, so we felt in control and informed of what was happening and this made me feel calm, I never felt scared or stressed or worried. My contractions started getting quite strong even with the epidural, which makes me keep thinking that it may have been a low dose that I got. But this was absolutely fine, I liked the fact that I could FEEL every time my body was working with my baby to help him come into this world. By the time I was in labour I actually had stopped listening to the natal hypnotherapy tracks, and was listening to David Bowie (which I think also helped to keep me calm!). Our baby was constantly monitored and always kept calm, his heart rate kept stable and I am sure that this is because I kept clam and because during my pregnancy I always listened to the natal hypnotherapy tracks on speakers, and not on headphones, so he could listen to them too. Dimitris was my rock, during the most intense part of labour, he reminded me to keep breathing calm and kept whispering “3,2,1…relax” in my ear, which instantly helped me refocus and relax; he also kept reminding me to go to our ‘Baobab Tree’ or our ‘happy place’, which in our case is a beautiful beach that we visit in Greece every summer. He kept telling me to imagine the two of us on that beach with our baby, enjoying the summer and the beautiful Greek sunsets. So 3 hours later our son was born, on Monday 1st February, 1.1 kg (2.44 pounds) and 36cm of baby boy. I couldn’t hold him straight away and this was difficult, but I understood that his wellbeing was first and the neonatal paediatricians quickly took care of him and put him in his incubator and then showed him to me. He was tiny and absolutely perfect, a tiny human being, my baby, my son. Leonidas. We called him after the strong Spartan warrior and king, because after all, our baby is a warrior. After the birth, came the most challenging part of the whole experience and probably of our life so far, which was to wait 9 weeks for our son to be released from hospital. I will never forget what I felt when the doctors told me “9 weeks”, it felt as if they had told me 100 years. I wasn’t able to comprehend how was I going to get through it, with my baby being 9 weeks in an incubator, and me, sleeping every night without him by my side. I kept listening to my natal hypnotherapy tracks, I got in touch with Gemma and told her what happened, she was so supportive and encouraging and sent me some of the post birth tracks to listen to. So I listened to them every day and I cannot describe with words how much her support helped me. Gemma LOVES what she does, she loves her job as a midwife and she truly believes in natal hypnotherapy and during those weeks, she helped us a lot, sending us lovely messages and emails. Again, the paediatricians and nurses were fantastic, they supported us so much and we were allowed to visit Leo at any time of the day and stay with him as long as we wanted. The head of the neonatal unit turned out to be Chilean, so it was a time for me to communicate in Spanish! 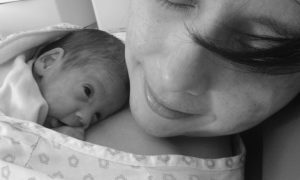 From the day after he was born, we were encouraged to do kangaroo care and have as much skin to skin contact with our baby as we possibly could. 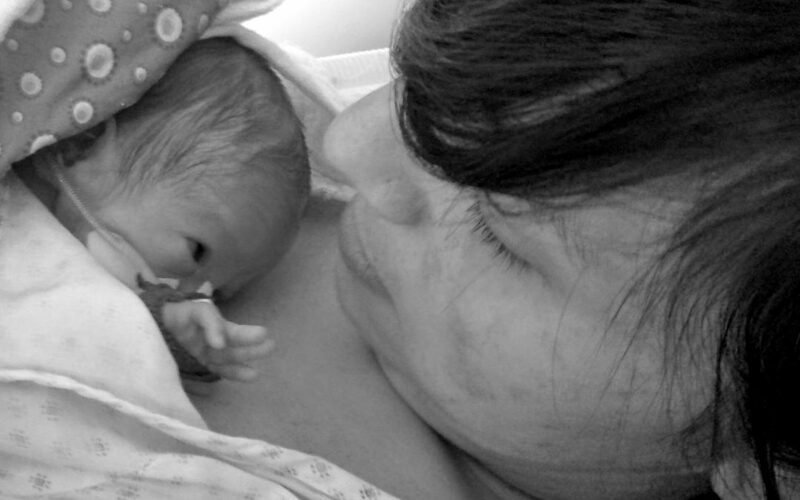 So I spent hours and hours with my baby cuddling with me, as the nurses tube fed him. We gradually got more and more involved in handling him, changing his nappies, slowly start to breastfeed him and bottle feed him, bathe him, etc. So, slowly time passed and it came the day that we had so much been waiting for. Leo was released from hospital on the 4th of April, 23 days before his due date. That day I felt as if he was born again and I was born again. I was going home, to sleep with my baby by my side for the first time. And two weeks later, on the 17th April came the day in which we flew home with him. Again, words cannot describe the joy. We honestly couldn’t have done things the way we did them without practising Natal Hypnotherapy and without doing the workshop with Gemma. We still get her lovely support and she came to do a breastfeeding coaching session with me and to meet Leo as soon when we returned to Scotland. Her experience as a midwife and her passion for Natal Hypnotherapy and the wonders that it does for a labouring woman and her birth partner are indescribable and if we are lucky enough to become parents for the second time, Natal Hypnotherapy along with yoga will be top of my list during my pregnancy. Natal hypnotherapy is something that needs practise if you want it to really work, pretty much like everything in life. But it does work! They told me that most women in my situation don’t react like this and that they usually demand for a c-section when it isn’t necessary I am writing this story almost 8 months after our son was born, with him sitting on my lap. And exactly 3 and a half months after he was discharged from hospital, we took him swimming in the Greek sea for the first time, and watched the sunsets at our favourite beach, just like Dimitris promised me as Leo was being born. Leonidas is a very calm and chilled baby boy, and people often comment on how laid back he is and I am certain that natal hypnotherapy babies often are. In fact, we sometimes still listen to the beautiful music of the birth relaxation tracks with him, especially if he is feeling uneasy and it seems to have an instant effect and calms him down. That and David Bowie :) I am still in awe of how things happened, of how calm and relaxed I kept and even our doctors and nurses in Germany could not believe how focused and calm I kept. Seeing it in perspective I am proud of the way we did things; his birth couldn’t have been more different from what we wrote on our ‘birth plan’ and sometimes when I read it, it makes me laugh because we cannot ‘plan’ a birth that we want as if it is something we order for lunch. The “I don’t want this, I don’t want that” attitude that I had at the beginning of my pregnancy all changed when my son was about to be born. I had an epidural, I had an episiotomy, I had an IV where antibiotics and many other drugs were injected to me. 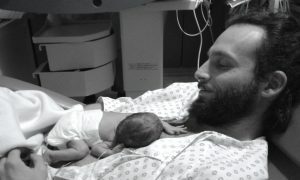 It was in fact perfect, Dimitris and I were absolutely fine with all of this, because we knew that THIS was our birth story and THIS was the way it was meant to be, and THIS was the time that our baby chose to meet us, and we will always thank him for that.